Fargo Shopping is the first on-line shopping platform in Kenya where sales and delivery are fully integrated and executed by an established and well recognised courier company. 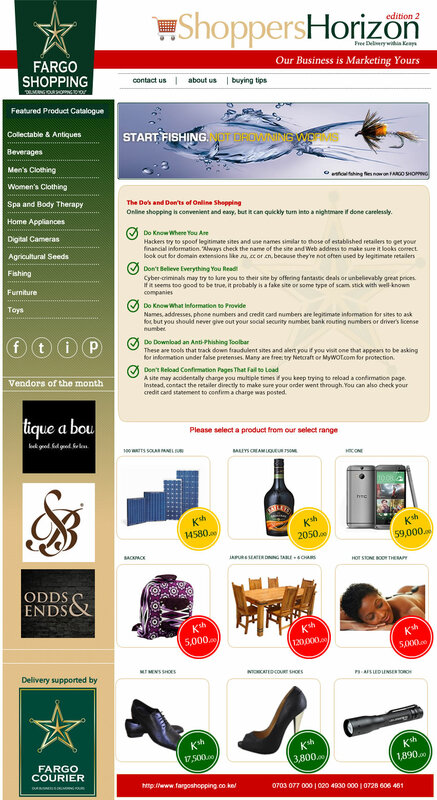 It is also a market-place where sellers can showcase their products to a wide audience. Fargo Online Shopping adds value to sellers’ products in a number of ways. With www.fargoshopping.co.ke, they receive free online marketing support for their products and services on a platform that is an e-marketplace with a large base of potential local and international buyers. Registration is free and buyers obtain a free website portal to which they can direct their clients to view all of their products, again offering them a free and easy access to a wider reach of clientele. All local deliveries are free of charge to the online buyers and are executed by Fargo Courier within a maximum of four (4) days subject to consolidation of products around the country.